Life is not always easy for those of us in the magical profession. I am writing this account as a warning to young wizards or to those readers who have not yet chosen their careers but are considering wizardry as an option. I began my community spell-casting with such simple thaumaturgical operations as blessing new shopping malls and business enterprises or local school and church fetes. Following on these activities I was asked to bless the odd local sports team setting out for an “away” match. just before the match to cast a victory spell for Canterbury. The game was a National Provincial Championship match between the two best teams. I was to go on to the field before the match to cast my spell in front of 40,000 spectators, most of them fanatical Auckland supporters. wined and dined me, were most hospitable. The only thing nagging at the back of mind was the thought that our star kicker Robbie Deans, the wonder boy, had recently broken his ankle at a home game. How would the team fare without him? Before the game started I went out on to the field to mutter the necessary cantrips and mantras whilst performing extravagant gestures with a flaming flare. To my surprise my activities were interrupted by three giant figures. These, I found out later, were “Snowy”, “Polly”, and “Loosehead Len”, mythical Auckland rugby heroes. A little discomposed, but by no means rattled, I went to take my seat in the VIP stand. In the row behind me was the Prime Minister, the Leader of the Opposition, and, if my memory serves me right, the Primate of the Anglican Church in New Zealand. As the game proceeded I soon knew that something had gone dreadfully wrong. Not only was the referee showing blind spots to the wrong team but the ball was bouncing the wrong way. Even worse, the absence of Robbie Deans in our team was made doubly disastrous by the appearance of a new and brilliant kicker in the Auckland team, Grant Fox, later to become a famous All Black! I cannot bring myself to give a blow-by-blow account of that doom-stricken game. Suffice to say that Canterbury, who had not lost a single game for three years, were beaten 32 to 3. As we left Eden Park both the Prime Minister and the Leader of the Opposition said some very hurtful things to me and hordes of odious Auckland fans gloated loudly over my failure and Canterbury’s consequent thrashing. I returned next day with my tail between my legs. How could I face the locals in Cathedral Square on Monday? I decided I had no choice but to bite the bullet and resign. On Monday, September 2nd, having informed the media of my intention to resign as city wizard and having arranged for a calligrapher to produce a suitably impressive resignation document to mark this historic event, I went to the Canterbury Promotion Council to resign. Ripping off my black robes and impressive pointy hat, and dressed only in an old sack. I handed in my resignation to the Executive Officer, Bruce Dunstan, a friend, sponsor and keen sportsman. National television crews recorded the sorry spectacle of me rubbing ashes into my face, tearing my long hair and beard, beating my breast and banging my head on the ground whilst crying out, “Mea Culpa, Mea Culpa, Mea Maxima Culpa”. Still wearing sackcloth and ashes I proceeded to my usual speaking spot in Cathedral Square where I made a full public confession. I then announced that I was going into exile. It not enough that the news media in New Zealand were having a field day at my expense, I was shown a copy of theNew Zealand Times from London (9/9/84) which had a full page chronicling my shameful failure. Hearing of my decision to leave Christchurch, Sir Hamish Hay, the Mayor and other city councillors, begged me to reconsider my decision. School children from all over the city said it wasn’t my fault and appealed for me to stay. However in spite of this heart warming demonstration of affection I knew that it would some time before I could go into any public place without being met with jeers of derision. Following the announcement of my decision to go into exile, letters were arriving at the Canterbury Promotion Council from other towns in New Zealand offering me sanctuary or just a holiday. Conjecture in Christchurch was that I might settle in their deadly rival, Auckland. On being asked by a newspaper whether or not Auckland wanted a wizard, the Mayor of that city, Cath Tizard (later Governor General of New Zealand), informed them that Auckland already had a witch (referring to herself) and didn’t really need a wizard, though he would be welcome to live there. Still smarting from the comments being passed about my performance, I informed the press that I was considering moving to the USA whose inhabitants were badly in need of a wizard and didn’t play rugby. At this time the tough Otago team were due to challenge Canterbury at Lancaster Park in Christchurch for the prestigious Ranfurly Shield. Both the Dunedin City Council and Otago Supporters Club rudely “beseeched” me to cast victory spells for my own team, but I was safely in Blenheim a couple of hundred miles away. A young colleague of mine, the recently appointed Wizard of Dunedin, taking advantage of my absence, was brought up in the train to use his magic to help his team to victory. He planned to sacrifice some Smurfs, a ceremony at which he was an adept. On the way to Christchurch, surrounded by high spirited Otago fans, a series of strange calamities struck the Dunedin Wizard. Firstly someone sat on his silver-topped cane and broke it. Then his finger got jammed between some seats. Finally he fell through a window and cut an artery in his wrist! Luckily there was a doctor on board. On arrival the bandaged wizard was rushed to Christchurch hospital, but by the time he was treated it was too late to get to Lancaster Park. Otago lost the match and went home crestfallen. Meanwhile I received an invitation from the Mayor of Whangarei, an attractive city far away in the North of the country, for an official visit, with a view to taking up wizardly duties there. My arrival there was dramatic and well received. Accompanied by my colleague the Duke of Wellington, I was rowed into the town basin to be met by Joyce Ryan, the Mayor. Warm friendly people surrounded us and I felt happier than I had been for some time. The only cloud in the sky was a demonstration by three witches complete with broom sticks shouting “Wizards go home! 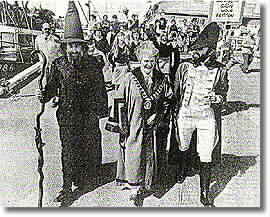 Our Spells are better!” whilst I was addressing the local citizenry in the town centre. There were also some letters to the local Northern Advocate from indignant religious fundamentalists and signatures were being collected to oppose any proposal that I be invited to become Wizard of Whangarei. Whilst enjoying this four day break from the rugby brou ha ha I heard that the Christchurch City Council, shocked at the thought of losing their wizard, were backing a Canterbury Promotions Council scheme to set up a Trust Fund for me. The Fund, administered by a board of trustees, would provide money for such essential items as travelling expenses, costumes and fireworks. This was a welcome change of attitude by the City Council after years of ill-concealed hostility. My insistence in avoiding contractual employment and any form of freedom- limiting welfare meant I had been operating well below my potential for years. I must admit I was tempted to reconsider my resignation. 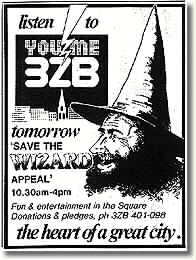 The local Radio New Zealand station, 3ZB, arranged to put a caravan in Cathedral Square on September 30th for an all day “Save the Wizard Campaign” of broadcast appeals for the Wizard Trust Fund. As usual there was a storm of frenzied letters in The Press from the religious fundamentalists accusing me of being thoroughly nasty if not downright evil and warning city authorities of Divine Retribution for encouraging me. The weather on that day was atrocious but people same from far and wide to make their contributions. Radio 3ZB asked people to keep them modest as this was a “mini-telethon” and the Wizard’s psychological medicine was much cheaper to administer than the high tech. physical medicine which was normally the beneficiary of telethons. After a day of seeing little children and old age pensioners bringing in their humble contributions, it was proving increasingly difficult to maintain my hard line about resigning. 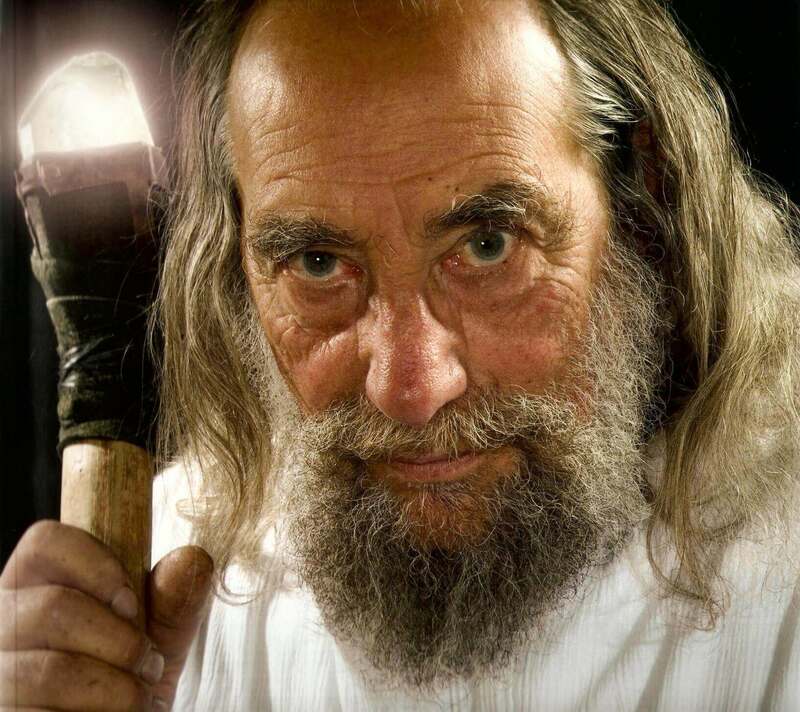 When finally the Minister for Tourism, Mike Moore, came into the caravan and, on national television, said that “not just Christchurch, but New Zealand too” needed a wizard. 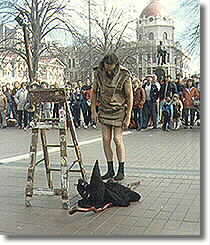 I capitulated and agreed to resume my duties as Wizard of Christchurch and ArchWizard of Canterbury. I published a proclamation in the local newspapers thanking the local people for their generous support and resumed my duties. 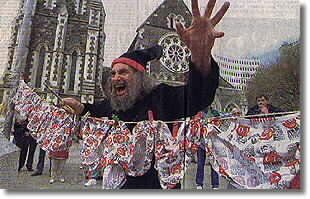 The next day on the front page of The Press was a fine picture of me in Cathedral Square, in full wizard regalia, burning the horrid sackcloth that symbolised my disgrace. I felt so much better and I had now set my sights on the national title. My next significant sporting spell was again with the Canterbury Rugby team. This time it was performed during their practice session and not in front of tens of thousands of over-excited supporters. I cast the spell the day before they were due to play the Australian national team, the Wallabies, second only to the All Blacks in rugby world renown. A picture of this appeared in the morning paper on the day of the match. Imagine my delight, and of course the delight of the team, when they beat the Wallabies. This was all the more astonishing because the Wallabies had beaten the All Blacks that test season (1986). I was back on form and so was the team, we deserved to win. They had recently shown their trust in my powers by signing the petition to parliament stating they too believed I had vanished on census night. 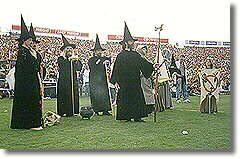 For the next few years nothing particularly unusual happened in my spell casting for sporting teams. I lost a few, but I won more than I lost. Then in 1994, after ten fairly uneventful years, Canterbury once again captured the Ranfurly Shield and rugby fever gripped Christchurch once again. 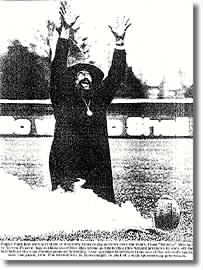 This was achieved partly because, after some years of being overlooked, the Canterbury team had insisted I cast a pre-match spell on them before they set out to challenge the shield holders, Waikato. The first major challenge was from our bitter rival Otago who had failed ten years before, during my temporary retirement, to get their own wizard to the ground for the last challenge which they consequently lost. Their team was now high up in the tables and they expected an easy victory. A vast number of their supporters came to Christchurch to make it the best attended provincial rugby game within living memory. An innovation which proved both dramatic and successful was the pre-match blessing of the Canterbury team’s new underpants outside the Cathedral. On the day of the great match the Lancaster Park authorities arranged that I should arrive by helicopter to land in the centre of the ground bringing the Ranfurly Shield to the field of play. Running a bit late, and tightly gripping the precious trophy, I was driven to the airport with siren screaming by a kindly policeman. On landing at the packed ground I blessed the Shield to protect it from being taken from us. 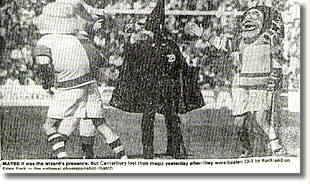 I was informed after the game that the famous coach Laurie Mains, who comes from Dunedin, observing my arrival, laughed derisively and said that it would take more than a wizard to save Canterbury from being slaughtered. Having performed this important function and with 30,000 eyes on me, I took up my position on the sidelines. I was using my new red and black wand to influence the game to bring about a victory for the home side. I was very nervous though I hoped it didn’t show. I had every reason to be apprehensive. It was a cliff-hanger with Canterbury, playing against the wind, well down in the first half. In the second half, with my help, they clawed their way back but were still a point down and in the last few minutes of the match they were heading for the Otago touchline. The crowd was delirious. Then at the last moment of the game the Otago captain intercepted the ball close to where I was standing. 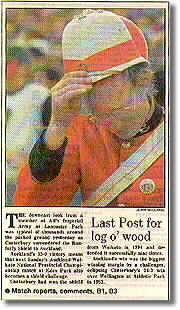 It looked as though only a miracle could save Canterbury from losing the “log o’ wood”. I conjured furiously and to the amazement of the crowd he fumbled the ball and caused a foul. Andrew Mehrtens neatly kicked it through the posts. The final whistle blew. The crowd went berserk. I was the hero of the hour. Laurie Mains was nowhere to be seen. My previous shame was now completely effaced and, since this was the end of the season, I could be sure of free drinks for some time to come. There is always a price to pay for victory and the day after the Shield match it was reported that the Otago University Students’ Association had passed a motion banning me from their campus. This was very upsetting as theirs was the only campus in NZ that I really enjoyed visiting. I was aware that it would not be wise for me to be seen publicly in Dunedin until a decent interval has elapsed. My nation wide reputation as a rugby miracle worker was so now so high that I was asked to bless the underpants of Wayne Smith, one of the champion Canterbury team of the mid- 1980s, who was now Chief Executive of Hawkes Bay Rugby. A vital match was approaching between the local team, the Magpies, and the Bay of Plenty team. If the Magpies won the match they stood a good chance of being promoted to the first division. The efficacy of the spell on Wayne Smith’s underpants was contingent on him being careful not to do anything whilst wearing them that might break the spell. Thousand’s of eyes were on Wayne during the vital match. He sat calmly and watched his team triumph over their adversaries. No Cantabrian will ever forget that wonderful winter of provincial rugby at its very best. The weather held up. 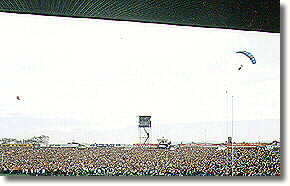 The crowds at Lancaster Park were enormous and the local team played like gods. We had a new wunderkid, Andrew Mehrtens, to kick for us. He was witty, charming, had a psychic sense of knowing how to intercept the ball, and he seemed to float above the ground before booting it unerringly between the posts. 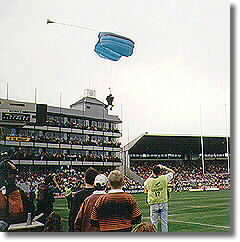 Following on my 1994 triumph I was invited by the Rugby Union authorities at Lancaster Park to provide magic for the major challenges in the 1995 season. Every Wednesday night for the past twenty years or so I have met with a small group of friends to play board games. These range from war games to games based on economic competition and political intrigue, though our favourites are those based on running rival railways. I recruited Anne and Derek, our games night hosts over the past seven years, together with their children, Robyn and Graeme, to form a band of priestly figures to carry banners bearing arcane symbols to back up my incantations. I also called on the enthusiastic Captain Cordite of Alfs Imperial Army to bring his ordinance to the ground to fire a round each time our team scored a try. Before each match we would process around the field of play with a smoking cauldron before taking up position near the opponents goal line with the aim of drawing the ball towards us. We defended the “Log O’ Wood” from all comers. Even, Waikato, Southland and Wellington, who were all first rate teams, could not break the magic spell over our players. September 1995 was the twenty-first anniversary of my arrival in Christchurch. The city was holding a “Wizard’s Week” to celebrate the occasion. The Wizards’ Conclave had brought visiting wizards to town. See The Stolen Image for stories and pictures. 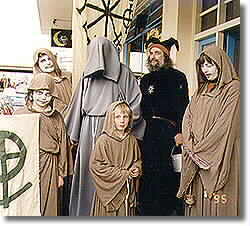 Destiny conspired that the greatest challenger of all, Auckland, would play Canterbury on the final day of Wizard’s Week. This was to be my finest hour. All seven wizards would combine their powers at the match and Captain Cordite would bring his tank for extra fire power. Moments before the match started I appeared in the sky over Lancaster Park and slowly descended by parachute whilst uttering anathemata against the Auckland team. 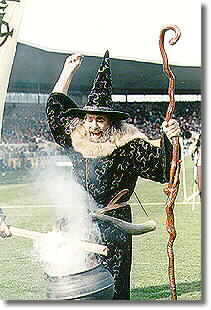 Joining the other six wizards and with the cauldron smoking we conjured up a great victory spell to end the season. Slowly it dawned on us that something was amiss. Our team were not playing their usual fast and daring game. They were stricken with terror as if they were being attacked by demons. The Auckland team were menacing and humourless and simply stomped on their opponents. Stricken with blindness the referee failed to see what they did to our hero Andrew. The tank was not called on to fire a single round. In spite of the combined efforts of six wizards and their banner bearing priestly attendants the Canterbury team was obliterated. The score 30 to nil against them. The crowd was shocked. We were even more shocked. Then we realised what had happened. Two days before, whilst all the wizards were gathered in the giant egg, a pair of fundamentalist fanatics from the New Life Centre had grabbed our magic staffs and taken them into the Anglican Cathedral for a desecration ceremony. This event shocked Cathedral staff and had been on the local television news. Unlike witches, wizards are supporters of orthodox religion, and we too regarded the incident as malevolent and insulting to the founding church of New Zealand. 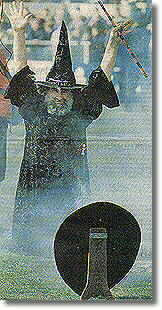 The desecration ceremony carried out round the tomb of the religious founder of Canterbury, Bishop Harper, had worked! We simply could not imagine individuals so depraved that they could hate Wizards, Anglicans and Rugby! Realising that the loss of the shield to Auckland was not our fault and that powerful forces of evil had been unleashed, we hurriedly wrapped our contaminated staffs in pure woollen material and put them away until the evil enchantment had worn off. I was spared from the sackcloth and ashes again but to date I have not been asked to cast any more spells for our local team.